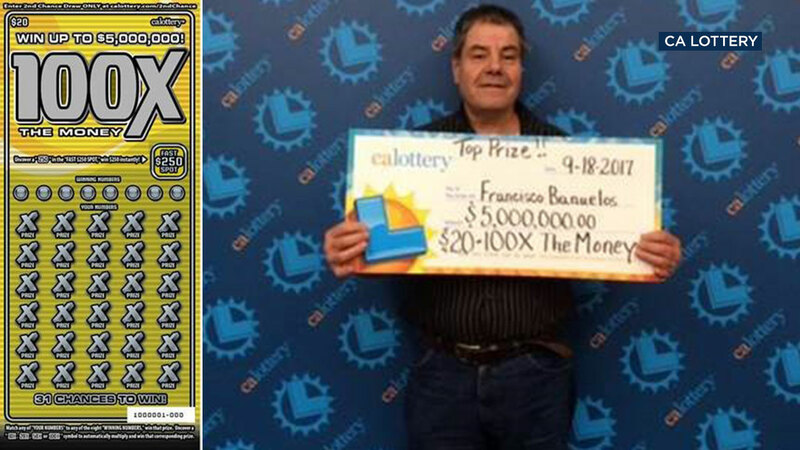 Francisco Banuelos, 58, won $5 million from a $20 scratcher ticket bought at a Pasadena liquor store. PASADENA, Calif. (KABC) -- A $20 investment in a scratcher ticket at a Pasadena liquor store paid off big for one man who claimed the top prize of $5 million. The winner, 58-year-old Francisco Banuelos, says he plans to keep working. But he will buy a house and then invest some of his winnings. "I was excited and a little scared," Banuelos said about his win, according to a California Lottery statement. The ticket was bought at Super Liquor, located at 125 East Orange Grove Blvd., Pasadena. The store gets a $25,000 bonus for selling the winning ticket. The $20 ticket was for the 100X the Money Scratchers game. Odds of winning the top prize are 1 in 3 million.